Thank you to the Curvy Sewing Collective for spurring me to sew this pattern! 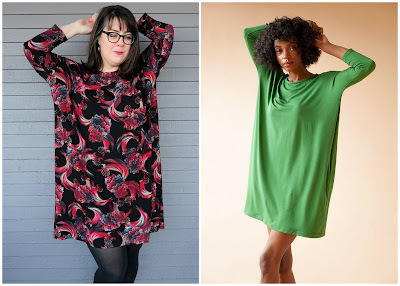 Some of the regular Curvy Sewing Collective contributors were chatting and expressed an interest in sewing up a Seamwork Tacara dress for a Same Pattern, Different Bodies post, in which sewists of all sizes and shapes make up the same pattern and compare fitting notes (coming soon!). I had already printed up the Tacara pattern, figuring I would make it someday, but this kicked it to the top of the queue! 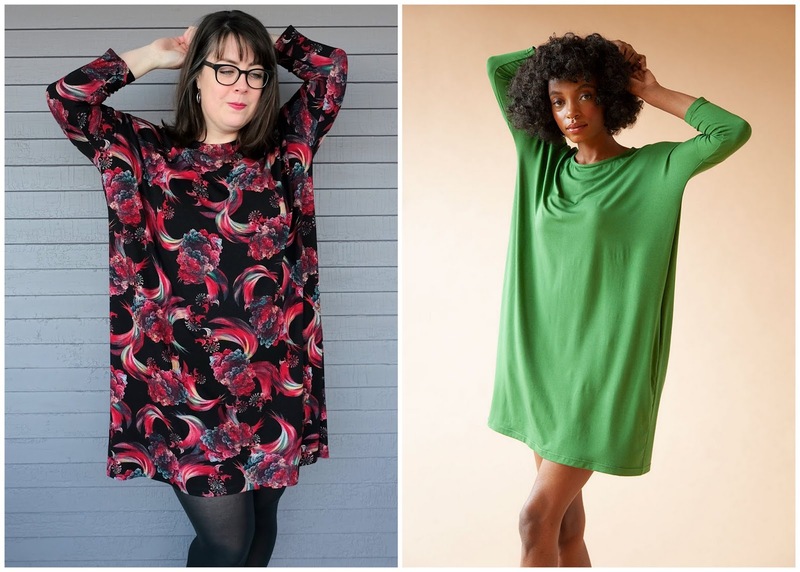 I'd read somewhere that the Tacara ran large and that sizing down might be a good idea... cocoon dresses are meant to be oversized, but I paid attention to that advice nonetheless. I ended up going with a size 14, which corresponded with my bust measurement, give or take, but was a couple inches smaller than my hip size. Worked out well! For fabric, I went with this fabric Tim bought me in Hanoi (good man, fabric shopping for me on a work trip!). It's kind of a lightweight rayon ponte, I'd say? The print is equal parts acid trip (psychedelic cauliflower, anyone?) and Golden Girls, and I love it. I skipped the in-seam pockets (*ducks tomatoes*) because I a) hate in-seam pockets and b) especially hate knit in-seam pockets. They always flop around and pull my dress down when I try to put anything in them. When I was cutting out the Tacara, the look of the super narrow sleeve pattern pieces made me nervous. I considered adding width, but ultimately decided not to. In the end, I really love the slim sleeves and the way they balance out the super boxy bodice- the proportions look great, methinks! I think the reason the super slim sleeves work is that the seam between the dress and the sleeves hits low enough on my arm that it's not cutting across the widest part of my bicep, which often happens with this type of dress. It's closer to the elbow where my arm begins to narrow, so it's not annoying me or squeezing my arm. Hurrah! I'm really pleased with this dress... comfy, cute, easy to sew. Just what I like! This is a cute dress! I have this pattern printed out already too. I am glad you decided to make this! Love the fabric and the dress. Looks very cute on you! Ohhhh, that fabric! Tim is a keeper! This is really great on you! Love that fabric too.